Today is the second day of the New Year and that means you have a lot to be thankful for. If you are reading this then you successfully avoided being eaten by a predator, struck by lightning, or getting hit by a bus. Besides all that you have to be thankful for in the previous year, you now have the opportunity to pursue life a new. It is a fresh year and it marks another chance for you to change your life for the better. In that spirit I want to share my New Year’s Resolution and a few ideas that might help you achieve your resolutions too. After all, changing bad habits into good habits is one of my practical steps to pursuing happiness. First, a few thoughts on New Year’s Resolutions. It is important to note that a resolution is in effect nothing more than resolving to accomplish something in the new year. More often than not, people resolve to change something that is a habit. It would be far easier if people chose as their resolutions to do one-off things, like visiting a national park or making a one time donation to their favorite charity. As part of the human condition we love a challenge and we realize that there is something inherently challenging about changing habits. We also realize that there is something powerful about changing habits. With that said there are some peculiar ways in which we respond as humans that can make habits either difficult or easy to develop. The first thing to understand about habits is that they aren’t necessarily part of your forward thinking brain, they are part of our subconscious brain. So, it isn’t as easy as rationalizing your way into a new behavior. You have to truly understand how habits work in order to change them. 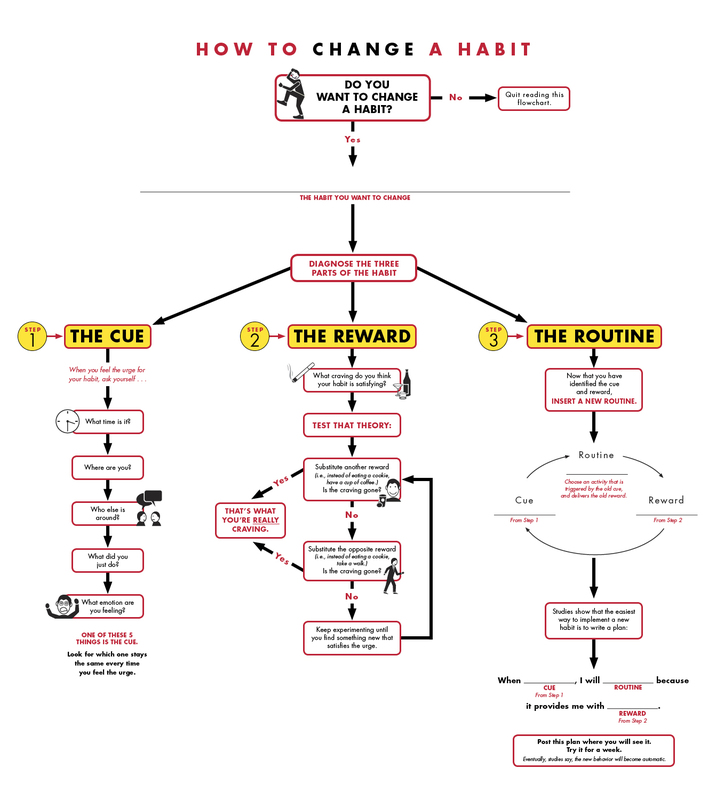 Hopefully you will find this chart useful in your efforts to change your habits into something more positive! I think it may take some reflection to identify your cues but once you have them nailed down you should be off to the races. As far as my fiance and I are concerned, we will be embarking on a daring adventure to no longer watch Netflix or Amazon shows and movies on weeknights after work. If I am to believe Dr. Duhigg, my cue is probably some combination of being on the couch (location) after work (time) and feeling mentally exhausted and frustrated from work (emotion). The reward is no doubt the stimulation and distraction from the frustration from work and being entertained without having to use my brain. So, our new routine will be to listen to music or an audio book, focusing on our respective hobbies, playing a board game with each other, or, if we are feeling spry, going for a run. My hope is that one or all of these will be effective in providing the same reward we get by distracting us from our feelings about work and result in a richer more fulfilled life than by watching another show on the television. However, the real benefit achieved is by avoiding wasting time on lowbrow entertainment that could be better spent with my fiance, sleeping, or pursuing truly enriching activities like volunteering or learning a new skill. I’ll let you in on a little secret about changing bad habits into good ones, it is addicting! In-fact, you might even say it is habit forming. Once you develop a routine of improving your routines you will feel truly in control of your life and your destiny. I hope that everyone takes on the challenge of setting a New Year’s Resolution, and can realize the link between eliminating bad habits and optimizing tasks to achieve their true potential.